The present article addresses education curriculum for pharmacy practice in the community and hospital setting. 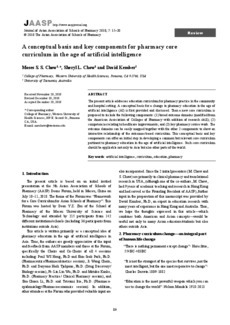 A conceptual basis for a change in pharmacy education in the age of artificial intelligence (AI) is first provided and discussed. Then a new core curriculum is proposed to include the following components: (1) broad outcome domains (modified from the American Association of Colleges of Pharmacy with addition of research skill); (2) competencies relating to healthcare improvements; and (3) key pharmacy course work. The outcome domains can be easily mapped together with the other 2 components to show an interactive relationship of the outcomes-based curriculum. This conceptual basis and key components can offer an initial step in developing a common but relevant core curriculum pertinent to pharmacy education in the age of artificial intelligence. Such core curriculum should be applicable not only to Asia but also other parts of the world.